Carrying on with our look at new watches from SIHH 2018, we now turn our attention to new releases from Cartier. From new Cartier Drive watches to new Cartier Tank Louis jewelry watches to new Cartier Tank Cintrée timepieces, as well as the return of the Cartier Santos there’s a little something for everyone. Let’s get a closer look. Cartier continues to expand their line of watches and came with this timepiece. One of Cartier’s newest models, the Drive de Cartier made its debut in 2016 to the delight to luxury watch fans everywhere. An elegant men’s dress watch, the Drive de Cartier’s cushion shape and minimal dial offers the type of sophistication that the French Maison does so well. 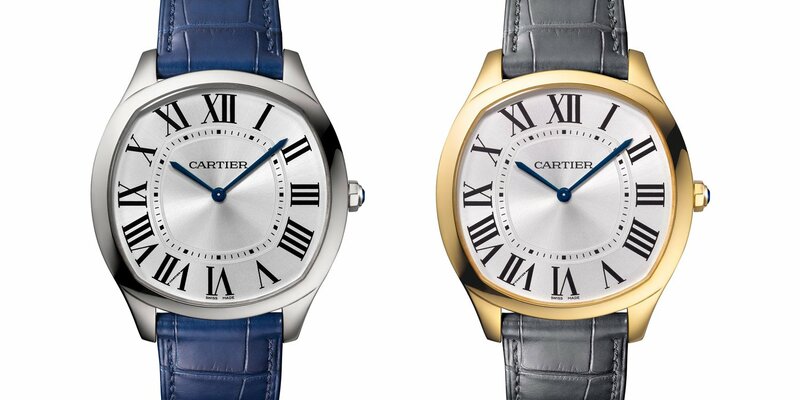 New for 2018, Cartier now offers the Drive de Cartier Extra-Flat in two new metals. New yellow gold and stainless steel versions now join the already existing pink gold and white gold editions. As its name suggests, the Drive de Cartier Extra-Flat sports a thin case measuring 6.6mm thick, which works great with the 39mm diameter. This time-only model includes the blue sword-shaped hour and minute hands along with the Roman numerals—both hallmarks of Cartier. To achieve its slimness, the Drive de Cartier Extra-Flat timepieces run on the Caliber 430 MC manual-wound movement. The steel version comes with a blue alligator strap while the yellow gold edition is presented with a gray alligator strap. Along with elegant timepieces, Cartier is also the master of precious jewelry watches. After all, Cartier is one of the world’s leading fine jewelers. Following the 100th anniversary Tank Louis Cartier models we saw released last year, for 2018, Cartier has added metal bracelet versions to sit alongside the leather strap editions. There are four new Tank Louis Cartier models in total, all in pink gold, all time-only watches, all powered by the manual-wound Caliber 8971 MC movement, and all flaunting a solid gold pink gold link bracelets. The small editions measure 29.5mm x 22mm and are available with or without diamonds on the bezel while the large models measure 33.7mm x 25.50mm and are also available with or without diamonds on the bezel. Since its introduction in 1916, the Tank has been Cartier’s flagship timepiece with plenty of different versions to satisfy a range of tastes. “Cintrée” is the French word for “bent” and it’s easy to see why Cartier has chosen this name for the Tank Cintrée watches. An elongated version of the traditional Tank watch, the Tank Cintrée bends and curves sublimely around the wearer’s wrist. With a name taken from the French to ‘curve’, the smoothly rounded case that hugs the wrist has been a feature since the first of the vintage Cintrée’s debuted in 1921. Its slender dimensions haven’t altered over the years, with a length more than twice its width giving it the striking rectangular figure folklore tells us was modeled after the tracks of the Renault FT-17 light tank used in WWI. 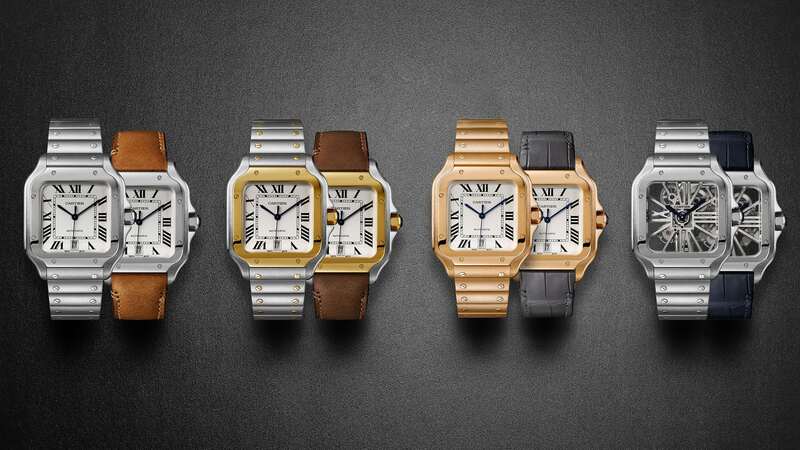 This year, Cartier takes the vintage Cintrée watch and offers three contemporary(ish) versions in platinum, pink gold, and yellow gold. The long cases measure 46.3mm x 23mm tall and wide, and 7.2mm thick. On the dial, Cartier decided to forgo their signature Roman numerals and opted instead for Arabic 6 and 12 numerals along with stick indexes. Again, these are time-only models with just two hands on the dial powered by the in-house Caliber 8971 MC manual-wound movement. 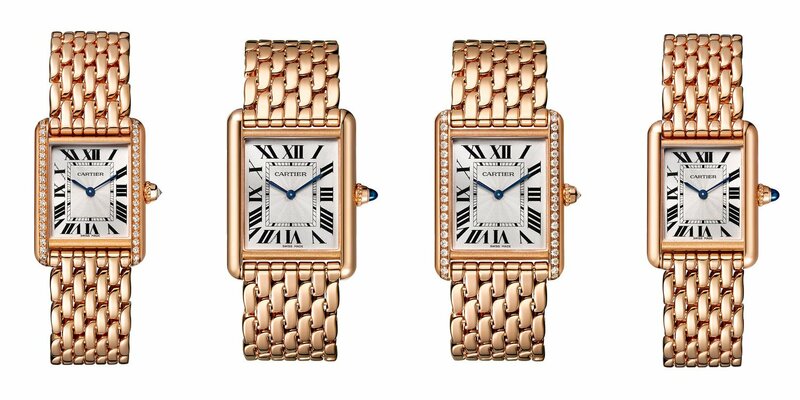 The platinum and pink gold versions of the new Cartier Tank Cintrée are outfitted with gray alligator straps with the yellow gold includes a brown alligator strap. In the world of luxury dress watches, the Cartier Tank has few equals and the Cintrée is among the most achingly stylish of all its numerous iterations. This new trio continues the faultless lineage that started over a century ago. Recently-installed chief executive Cyrille Vigneron has made no secret of his desire to resurrect the most illustrious of Cartier’s landmark designs. The new Santos range symbolizes a modern-day reworking of the first and most famous of the brand’s watches, and 2018 marks its 40th anniversary, with a contemporary collection making its first appearance. Initially created in 1904 by Louis Cartier for his close friend, Brazilian aviator Santos Dumont, the original was reinvented in 1978 with a more sporty aspect, giving us the now familiar rounded square case in steel and gold, with crown guards and an automatic movement. Previously available only in precious metals, this more casually styled and affordable Santos became the must-have throughout the eighties. SIHH this year sees the launch of the next generation, presented in large and medium sizes; the bigger of the pieces complete with date function at six o’clock, the smaller without. In all, there are 12 variations on the main theme, offered in steel, all gold and a bi-color combination of the two. Cartier has outfitted them with a choice of leather strap or metal bracelet, with a quick change system that lets wearers alternate as the mood and situation dictate. The first Santos to use an in-house automatic movement, the caliber 1847 MC purrs away inside the majority of the series, developed in 2015 and first used inside the Cartier Clé collection. Two truly outstanding exceptions are a pair of skeletonized versions of the watch, which are powered by the manually-winding caliber 9611 MC. Easily the star of Cartier’s formidable lineup, the modern reissue of the all-time classic Santos is already creating much of the buzz in Geneva. Among the many highlights of this year’s SIHH show is the ‘Mystery Clocks of the Cartier Collection’ exhibition, a display of 19 incredible pieces dating back to the early 20s, inspired by the father of modern magic, Jean-Eugène Robert-Houdin. 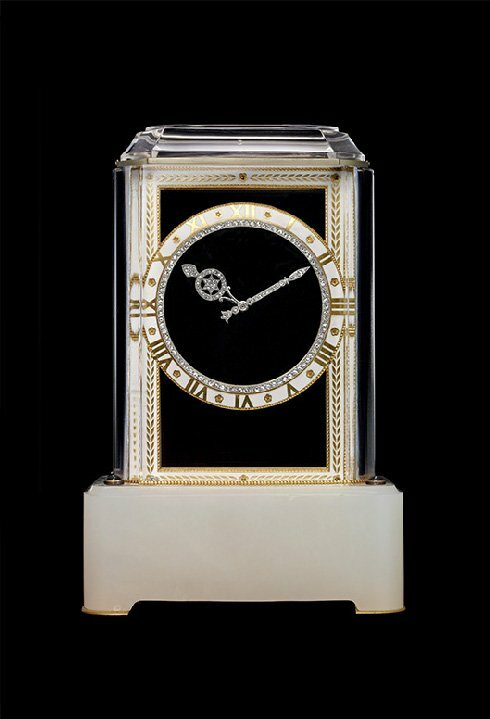 Among the most expensive objects ever produced by Cartier, these ‘mystery’ clocks feature hour and minute hands that appear to float without any means of support and unconnected to any internal mechanism. Created to run in conjunction with the exhibit, the maison is releasing two extraordinary new timepieces; the Rotonde de Cartier Skeleton Mysterious Double Tourbillon and the Rotonde de Cartier Mysterious Day & Night. The first, a magnificent 45mm, platinum-cased piece has an apparently free-floating tourbillon movement that completes a revolution of its transparent off-centered aperture once every 60 seconds, while the second tourbillon cage on which it is mounted performs its own rotation every five minutes. The skeletonized Roman numeral hour markers act as the watch’s bridges to hold the hand-finished internal components, and the blued steel sword-shaped hands display the time on a sub dial at 12 o’clock. Severely limited to just 30 pieces, it is available with either a diamond baguette bezel or in a full pavé version on both the case and movement. The Day & Night model represents the first time Cartier have incorporated two of its most impressive complications into one watch. The mysterious movement, developed for the brand’s first mystery clock, the Model A from 1912, drives the stylized sun and moon of the day/night complication across the upper half of the dial, giving the impression they are sliding through mid air as they indicate the hour on a six to six scale across the top. On the lower portion, a single blued steel hand show the minutes on a retrograde display. Housed in a 40mm case in either white or pink gold, the central dial segment is finished in a radiating guilloché and a sapphire cabochon crown adds the final classic Cartier touch. 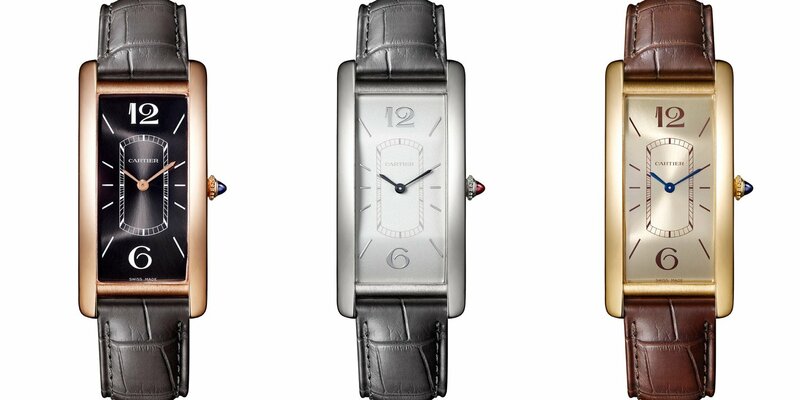 What do you think about these new watches from Cartier? Would you wear them? Leave us your thoughts below and stay tuned for further coverage on SIHH 2018.